This page outlines the mechanisms by which sbt loads settings for a particular build, including the hooks where users can control the ordering of everything. As stated elsewhere, sbt constructs its initialization graph and task graph via Setting[_] objects. A setting is something which can take the values stored at other Keys in the build state, and generates a new value for a particular build key. sbt converts all registered Setting[_] objects into a giant linear sequence and compiles them into a task graph. This task graph is then used to execute your build. Load project *.sbt files (build.sbt and friends). foo in ThisBuild := "hi"
// here we load config from a txt file. All settings defined in the project/Build.scala file (shown above). All settings found in the silly.txt file. 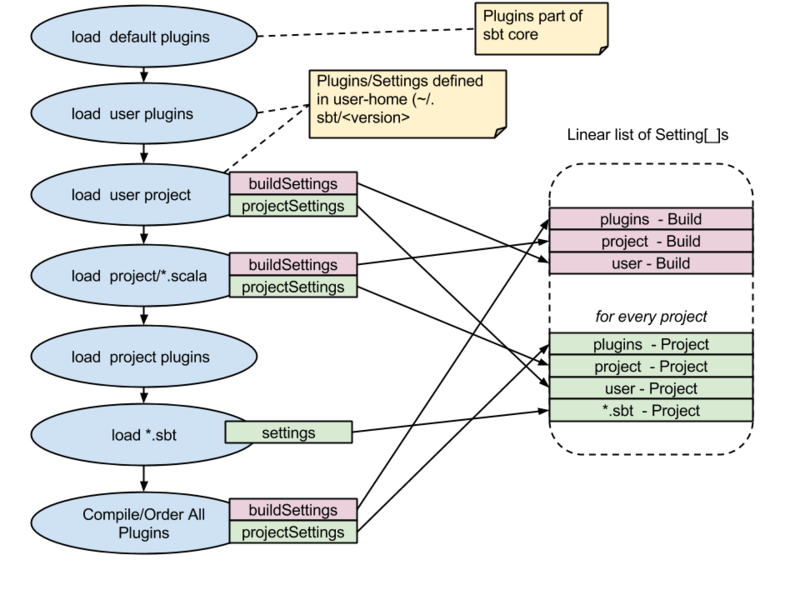 buildScalaFiles The full sequence of settings defined directly in project/*.scala builds. userSettings All the settings defined in the user directory ~/.sbt/<version>/. defaultSbtFiles Include all local *.sbt file settings. For example, let’s see what happens if we move the build.sbt files before the buildScalaFile. However, when we load this new build, we find that the version in version.sbt has been overridden by the one defined in project/Build.scala because of the order we defined for settings, so the new version.sbt file has no effect.